The map of Italy below shows the various regions. Our selection of the top Italian cheeses focuses on Lombardy (Lombardia), Piedmont (Piemonte), Valle D'Aosta, Apulia (Puglia), Emilia-Romagna, Campania, Sardinia (Sardegna), Sicily (Sicilia) and Tuscany (Toscana) - all of which produce outstanding regional, handcrafted cheeses. Italy is really a vast group of localities stitched together over the centuries into its present national form. After all, it wasn't until the late 19th century that Italy was unified as a country from its earlier medieval city-states. As a result, Italians have always retained a very strong sense of local and regional identity. Geographic and cultural distinctions tend to keep Italians loyal to family, town, region ... with the nation a distant last. This is very unlike France where the people have a very strong sense of national pride. So when it comes to the cheeses of Italy, here again there is fierce loyalty, region by region, to traditional regional cuisines and regional specialty cheeses. Go into a small cheese shop in a small town in Lombardy for example, and you will find all the cheeses made in Lombardy, but it is unlikely you will find a cheese from Tuscany or Campania. Just as London has Neal's Yard Dairy (a MUST to visit for British cheeses), so in Italy there is the equivalent called Peck's La Casa del Formaggio in Milan. 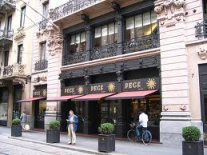 Now owned by the Stoppani family, Peck has 6 stores in Milan featuring all different specialties, but its main cheese shop is on Via Speronari. It is an absolute paradise for cheese lovers! Featuring as many as 600 cheeses (not all different cheeses, but rather a range of cheese varieties, produced by many different cheesemakers), this store does a huge volume of business. All the names, all the shapes, all the sizes, all the varieties are there for you to sample. When shopping for Italian cheese, whether here in the U.S. or in Italy, it helps to know a few Italian words which will usually appear on the labels of authentic, handcrafted and name-protected (D.O.P. - Denominazione di Origine Protetta). Okay - Here we go. 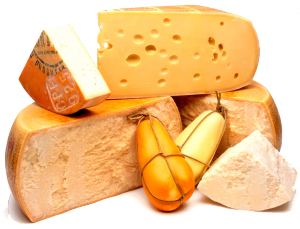 My list of 14 top Italian Cheeses you simply must try! See the links below to learn more about these cheeses! You can also find some helpful suggestions about Pairing Italian Cheeses with Wine by clicking on that link below. When you travel to Italy, be sure to treat yourself by trying the local cheese specialities, wherever you may be in the country. 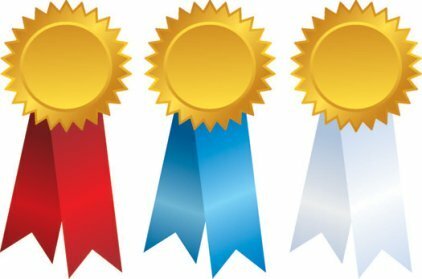 You simply cannot go wrong and you will be honoring the local population, local cheesemakers and local restaurateurs. Ask any hundred people to list their favorite ten or twenty cheeses from Italy and the lists will all be different.